Sean has a long list of professional experience including business startup and ownership, consulting, project and product management, engineering and quality control. With over 18 years management experience, Sean is capable of guiding project or organizations of any size or scope. Having a very strong knowledge of technology (hardware and software) and business processes, Sean can utilize his practical experience to best identify and recommend solution systems. Sean has had business success in Oklahoma and the East Coast as well. Alongside Felicite Moorman, Sean started several successful companies in the Baltimore/DC region, creating the 1st and 6th largest title business inside of 5 years and handled $750 million in real estate transactions. 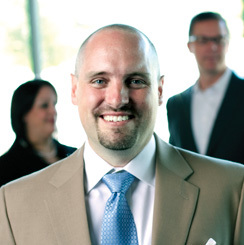 Sean’s management experience ranges from small, startups to a Fortune 500 company. Sean’s philosophy is that business, like life, is about change. Everything interesting happens as a result of change and as a result it is something to be embraced and welcomed. It’s his believe that businesses who remain static have already begun to decline.